What do you do when you want to get better at something, especially when you don’t have access to a teacher who can look over your shoulder and hold your hand? If you are anything like me, you muddle through. Maybe “learning by doing” is the best way to learn, but certainly not the easiest way. Still, it seems to be my way of approaching just about everything. It’s been about a year since I first began growing sourdough starter and trying to make bread with it. Every time I tried to make a loaf, it would have some problem or another. There are so many variables such as ambient temperature, the frequency of feeding the starter, how much to feed it, the right consistency, the time it takes for the bread to rise, to knead or not to knead, one rise or two, to refrigerate the dough or not. I took copious notes on what worked and what didn’t work. At some point I gave up completely and tossed the starter into the compost bin. Then some months later I grew some more starter. 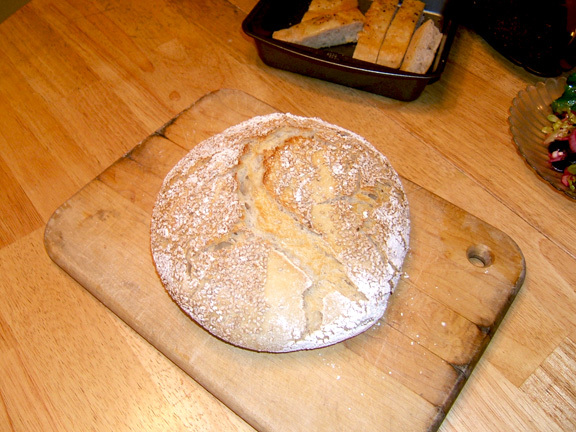 Then I made a few more attempts at making sourdough bread. Finally, it all came together and something clicked inside my head. I was trying too hard to make it be something different from regular bread. I finally realized it’s just bread with different yeast. Finally, at long last, success was mine! I made a loaf for my neighbor. The next day I made a loaf for us. And now I have loaves of French bread made with regular yeast that I baked just this evening. At some point there was a breakthrough of sorts. I finally became comfortable with the whole process and now I am free to be creative. Going through that somewhat agonizing learning process actually made me a better baker all around. There is a lesson here somewhere. Just like with painting, or collage, or drawing, there is a common thread running through it all. It’s all your art, just different media. I know that when I want to work in a new medium, suddenly everything feels strange and unfamiliar. Suddenly I’m poring over art books and instructions trying to figure things out intellectually. If I can, I go to workshop after workshop. I want to do it the “right” way. 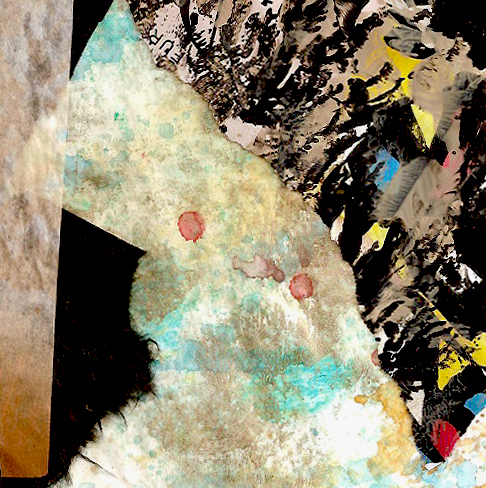 I attended three different collage workshops over a period of five years before finally settling down to decide how I wanted to express myself through collage. 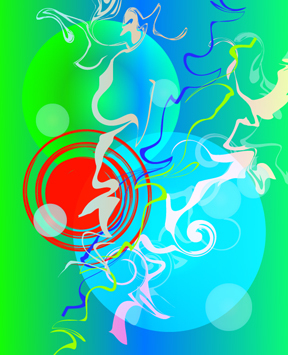 Digital art is no exception. I consider digital art to be just another medium, so right now that’s my main focus. I’m trying to get familiar and comfortable with all of the tools. There are several programs that all have their own advantages and disadvantages. Each of them has something wonderful to discover. I wish I had a teacher right now, someone who knows it all and could just sit down and tell me something that will open my mind to all the possibilities. But I can’t afford that kind of teacher. So my teacher is — well, myself. And online tutorials, of course. There are online tutorials for just about everything. Excellent choice of words. At the moment I describe myself as ‘Artist currently working in textiles’ as this gives me permission to change my materials and focus at any time. Speaking of online workshops. I don’t have time to enrol, but a friend pointed me to these. Someone might like to join in to one or more. Myfanwy, I like your statement about yourself and your art. It covers any and all situations! 🙂 Thanks for the online workshops link. I have clicked “like” on their facebook age. I love their papers. Martha, I have always loved baking bread. Finally after 5 good years of practice, I am good at it. Here in the midwest the temperatures vary greatly and that affects my breadmaking. Finally decided to let it rise microwave (no heating), and that produces good results. I miss the sourdough breads I use to purchase at Trader Joe in California. The walmart brand does not taste nearly as good. I tried starters, and gave up. I just make good whole wheat (white), and it is good enough. I agree with the concept of learning from a teacher. Thank goodness for the internet where you can learn anything. Pat yourself on the back. I attached a link for some good soup for the winter. Caroline, who knew that bread could be so full of nuances and require so much practice? But I love baking it too. I equally like sourdough and bread made with regular yeast. The sourdough just wasn’t going to get the best of me, so I stubbornly stayed with it. Thank you for the recipe link! (Readers, click on Caroline’s name in the comment.) These sound delicious! Thank you for visiting and for your comment, Bren! I loved looking at your blog and your art. Do stop in again. Yes, Margaret. It’s a blessing and a curse I think. Works well for me, but probably not so much for brain surgery. great post for sure….life IS a learning process whatever medium. I seem to go about learning the “hard knock” way….flounder, try again until you settle into the process for your chosen medium……whether it is bread or using oils/ or collage/ or cold wax…….we all learn our OWN way….. Yes, Karin Lynn! Secretly I’d love to just attend classes and workshops all the time, go on art retreats, mingle with other artists. That’s always nice too. But at some point we still have to cut the cord and go our own way. I can relate to your bread baking story (and the larger lessons that come from it). My husband was diagnosed with Celia’s about a 1-1/2 ago and I’ve had to relearn how to bake and cook gluten free. Last night I attempted a gluten free yeast bread for the first time and was pleasantly surprised, yet cognizant of tweaks to be made in future. Nicole, I’m glad you decided to say hello, and so appreciate your stopping by and reading. It seems we’re always presented with new things to learn if we’re open to them. Artists, especially, can become better and better by staying open to all possibilities. Congratulations on your bread success too!